Coco, the new animated movie from Pixar and Disney, is certainly a treat for the eyes. It may well contain the most dazzling animation I’ve ever seen. 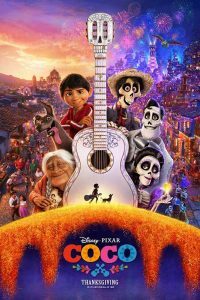 Coco tells the story of young Miguel, a Mexican boy who loves the guitar and music. His hero is the legendary actor/singer Ernesto de la Cruz, who is also Miguel’s great-grandfather. Miguel is told by his family that Ernesto deserted his family for fame and fortune in the movie and music industry. For this reason, music has been forbidden in Miguel’s family. Miguel is told that he must make a choice between music and family. He can’t have both. Miguel’s family makes shoes, and he is encouraged to join in the business and leave music behind. Yet Miguel still wants to play and sing like his idol Ernesto. On Dia de los Muertos (Day of the Dead) Miguel visits Ernesto’s tomb, where his guitar is enshrined. Miguel takes the guitar to play it. In doing so, he and his dog Dante are transported to “the other side” where he sees many of his deceased relatives. They are skeletons with eyes and clothes. Miguel’s relatives are happy to see him, until he tells them that he wants to see Ernesto. Horrified, the family tries to bring Miguel back to the land of the living, making him promise to give up music forever. However, Miguel persists, running from his deceased family, intent on meeting Ernesto. Along the way, Miguel encounters a skeleton man named Hector, who tells him that he knew Ernesto and played music with him. Hector fears that he has been forgotten by everyone and promises to help Miguel if Miguel, in turn, keeps Hector’s memory alive. The depiction of the land of the dead is mysterious and beautiful. Miguel learns that Ernesto plays a concert every year on Dia de los Muertos in a large outdoor stadium, complete with cameras and screen to project his image to his adoring fans. Through his journey, Miguel encounters danger, close calls, and family secrets which help him to understand his family traditions, and to right wrongs as well. And, of course, he has to return to the land of the living before it’s too late. The producers did much research into the richness of Mexican culture to make Coco authentic. And in most ways, it is. The love of family and music are certainly part of the culture. It’s also risky in an animated film to spend so much time with the dead, but it works. The skeleton figures with big eyes bring an otherworldly sensibility to the film. Even Miguel’s own fingers seem to lose their skin the longer he’s down there. But I don’t think parents need to worry that this will frighten young children. None of the small children in the theater with me on a Sunday afternoon seemed particularly bothered by the dead. I wonder if they will comprehend it all. One complaint: I wished the filmmakers would have incorporated more of the religious traditions of Mexico into the film. With the exception of a cross and, if you look closely a glimpse of the Virgin of Guadalupe on a wall, you’d never know Mexico was such a Catholic country. When dealing with life, death, and family, an inclusion of the popular religiosity would have enhanced the film. Despite that omission, there’s a lot to recommend in Coco. It has already become a huge hit in Mexico, and is also doing quite well in the USA. Coco is a bit long at a little over two hours, and seems to drag at times. That may be a problem with small children. But with engaging character, music, and the extraordinary visuals, there will be enough to keep their attention. On the subject of the length of Coco, it’s unfortunate that the short animated feature, Olaf’s Frozen Adventure is paired with Coco. At 20 minutes, this mediocre spin-off of Frozen is a needless delay, especially for parents with young children waiting for the feature. I understand that theaters are going to pull Olaf, which is good news for all.